I am a kind, romantic who wants to find happiness. But I can also be passionate and hot. I dream of finding someone to make the same important part of my life as a family and take care of him and us as good and passionate. I like to get new experiences, meeting new and interesting people. 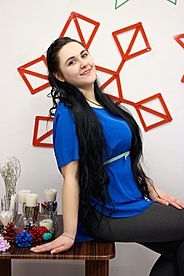 I am loyal, cheerful girl and have a good sense of humor. For me true love is based on a loving passionate relationship. I came to this site to find a man for a serious relationship and for the family Are you ready for it? I will wait for you. I am looking for a good man who has a clean heart and there is a spark in his eyes. I do not like lazy men, I need someone who can support my every activity in life. I appreciate in a man: loyalty, courage, sense of humor, responsibility, modest, playful, naughty and you do not need to worry about offending me, I am an adult and I understand gentlemen also have needs and desires just like I do. Do not be shy, share with me all your wild fantasies.. I am also looking for a very passionate and wild man who is ready to curb my passion and are not afraid to experiment. I dream of a strong and confident, can communicate on any topic, man who exactly wants one woman but the best. We can become the best for each other ? ?